Scenes From the Great American Scream. 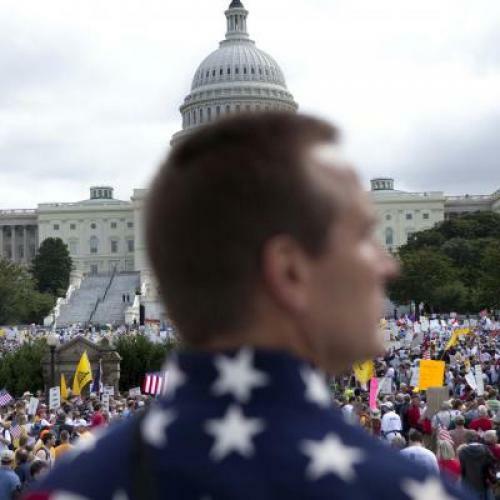 On Saturday, September 12, America threw a gigantic temper tantrum in Washington D.C. Organizers called it the “largest gathering of fiscal conservatives in history,” and they’re probably right. But for an angry, anti-government fit, the march was remarkably civil. They had come in large bands--14 buses from Morristown, New Jersey; 12 from Harford County, Maryland--prepared with picnic baskets and lawn chairs. They festooned their hats with teabags and dressed in Revolutionary-era finery. Marchers smiled and waved and met new friends, laughing at each other’s signs and exulting in their power. You might call it solidarity (the logo for the march was a raised fist against the Capitol Dome) but that would sound … sort of … communist. Their complaint? Hard to say, really. Some, like the contingent of coal miners in hard hats with anti-cap-and-trade signs, had a concrete beef with the administration. But for most, there was both an incredible specificity to their protestations--all those czars, and ACORN, and Obama’s missing birth certificate--and a fuzzy vagueness. What makes you so sure? I asked Shawn Nicholls, of Delaplane, Virginia, who had come with her young son. “Just the people who surround the president. You have to question some of the associations,” she answered. “It’s like a big puzzle, and you get a few pieces of it here and there. You’re trying to figure out what’s going on, and you can’t ignore these pieces anymore,” she finished. After congregating at Freedom Plaza, the entire mass strolled its way down Pennsylvania Avenue, with the occasional cheer of “YOU LIE,” or just an undefined roar, sweeping the column. We pressed up against the Capitol steps, hearing an endless rotation of speakers exhort the crowd. Images of Obama were everywhere: wearing a Che hat, as the Joker, in culturally ambiguous tribal regalia, as a wolf in sheep’s clothing. And then, as The New York Times reported later, the president himself passed over the crowd in a helicopter on his way to sell health care in Minnesota. The crowd waved, not realizing whom the copter contained. This march, however, was only the culmination of a three-day bonanza of anti-government events, collectively known as the 9/12 Project. The most dedicated corps had come on Thursday morning, to the Armory--a vast hall in fairly desolate area in Ward 6, where the AIDS rate is 2.8 percent--and alighted on a rank of bleachers. They sat attentively, but responsively, while politicians like John Boehner and Jim DeMint, as well as FreedomWorks activists, outlined the reasons for Saturday’s march. “This isn’t a Democratic administration. This is a progressive administration,” explained Representative John Shadegg, of Arizona. “And they want to destroy everything that you and I think is great about this country.” Shadegg is a good speaker--the way he explained health care, the Democrats had messed it up by fixing the tax code such that only employers could buy insurance, and now Obama wants to raid Medicare to fund a system of government control. This is about a radical revolution! a woman shouted behind me. “The same government that can’t run the post office?” Shadegg continued. “The same government that can’t run cash for clunkers? You let them run a health care plan? I don’t think so.” Noooooooooo, the crowd agreed. The longer one listened, the more it seemed like the nation was really under attack. “I’m worried about George Soros,” said one woman, in a question and answer session. “I’m worried that the Democratic Party and our country have been hijacked by radical socialists!” Senator Jim Inhofe agreed. “You do have to wonder, who’s really in charge?” he said from the dais. “Clearly it’s the elitists and the money that’s coming out of Hollywood.” Boot ‘em out! a cry went up. But as much as it appeared the forces of darkness were gathering, this was also a profoundly hopeful event. The Republicans have alternatives--they brandished a reassuring stack of paper that contained all the proposals they’ve been introducing, only to be ignored by the mainstream media and crushed by Democratic leadership. And with the help of ordinary citizens, there was still time to stop the madness. Later that day, they convened again, this time at Upper Senate Park near the Capitol, for a “Physicians Rally Against Socialized Medicine.” There’s something so trustworthy about people in lab coats, and the ultra-conservative group American Association of Physicians and Surgeons had gathered their members to dramatize the point. This is when Obama really started to look bad. And then, it became not only anti-doctor, but also anti-American, to suggest that the U.S. health care system even needed reform. “We have the best health care system here and everyone knows it,” said another speaker. The cheer went up: USA! USA! USA! I have never felt more welcome as a reporter than I did at a “Meet and Tweet,” advertised as a gathering of tea partying women on the eve of the march, at the Doubletree Hotel. “Are you a tweeter?” cried Dianne Shaw, sitting primly cross-legged, in a gray skirt set. About ten middle-aged women sat around a table crowded with empty wine glasses and a few bottles of Heineken, delicately munching mini cheeseburgers. I explained that I wasn’t, but no matter--they sat me down to join the conversation. The discussion drifted from outrage to outrage, lingering on health care. No one actually doesn’t have insurance, the women agreed. Obama’s numbers of the uninsured keep wavering; maybe he just stopped factoring in the illegals. Besides, everyone can just go to the emergency room, or one of those clinics that Wal-Mart runs. “This administration does not understand the free market,” someone pronounced. “The only people with private insurance will be unions!” said another. In a weekend well-attended by women but largely led by men--nearly all the speakers at all the rallies were male politicians and talking heads--this was a rare moment of female camaraderie. It felt like they were on the edge of something big. “We should have a women’s party!” someone proposed. I was about to leave, but Judith Weiss from New York City--who had been proudly pointed out as a Jew, which was as close as the group came to diversity--flagged me down. “Can I tell you what I like about Obama?” she asked. “I think the fact that there’s a normal black family in the White House. … If he could make being nerdy fashionable among black kids, he will have done a good thing.” The women nodded in agreement. No racists here! The patron saint of the entire movement, of course, is Glenn Beck. “Beck 2012” signs dotted the audience, and at one point ten women got lined up in a row, each with a letter from his name: “G-L-E-N-N [heart] B-E-C-K.” People speak of him not just with appreciation, but reverence. Beck harps constantly on the theme that this isn’t a partisan movement--these ordinary Americans are fed up with Democrats and Republicans. In an interview with Beck, Republicans Senator DeMint and Representative Mike Pence attempted to salvage some high ground for their party, in an almost painful process of self-flagellation and abasement. Rule #1: Glenn is always right. “What will it take for people like you to be able to say, ‘You know what, I gotta clean out the hornets nest in my own party?’” he asked them. "I'm a recovering alcoholic. I can tell you the moment when I said, ‘Enough, I've gotta change my life or I'm gonna die.’ I have not seen that from the Republican Party." "Glenn, I think you're right,” DeMint answered, after bravely arguing that the GOP was actually starting to figure things out. “I don't think we have come to the point as a party that we're willing to admit that we've got a problem. And as you know, that's when the recovery begins. ... So I still can't tell you who to trust, but I can tell you who you can't trust. I know the Democrat Party right now is solid moving us in the wrong direction. We've gotta get this Republican side together so Americans know who to come to." The crowd disbursed gradually, like a fever subsiding. Lines for some 70-odd port-o-potties stretched dozens of people deep. For blocks, garbage cans were filled with crumpled signs. As people flooded out, D.C. residents percolated back in, some wearing Obama t-shirts, looking bemused: What in the world had just happened?